How long does it take for the best U.S.-born hockey players to come together as Team USA? 16 minutes and 56 seconds. That’s when Team USA’s Zach Parise deftly redirected a pass from Ryan Sutter past the Team Canada goalie late in the first period of the World Cup of Hockey exhibition game at Nationwide Arena on Friday. The crowd of 17,791 leaped to their feet, chanting “USA! 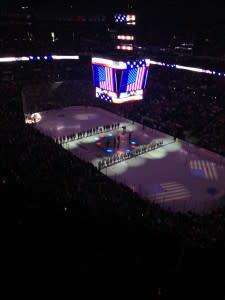 USA!” the Blue Jackets cannon shook the rafters and startled those not familiar with the local goal-scoring tradition. Sixty-five seconds later, Team USA’s Patrick Kane worked a little of the magic that has so frustrated Blue Jackets fans over the years. The Chicago superstar glided in from the side, fired a shot at Team Canada goalie Carey Price and then started poking and poking at the rebound until the puck was in the back of the net. Thirty-eight seconds later, a couple of cross checks from Team Canada’s Sidney Crosby in front of the Team USA touched off a mild melee – the first of many! – that included a few swings and scuffles. So yes, the World Cup of Hockey had officially begun during this 2-minute span, even though this was “only” an exhibition game. The all-out, cross-border, anything-but-friendly rivalry between these two hockey powers was back in all its magnificent fury and glory. And, what with this being such a great rivalry, there was no way the this wasn’t going to be a close game. Team USA won 4-2 as Derek Stepan scored an empty netter with 1:21 to go that finally sealed the win. The game marked the culmination of Team USA’s week-long training camp at Nationwide Arena, and in so doing helped Columbus join the ranks of International Hockey Cities. For example, Team Finland chose Helsinki for its training camp; Team Russia was in St Petersburg; Team Sweden in Gothenburg; Team Canada selected Ottawa. Lots of passionate hockey fans. Blue Jacket and Team USA member Brandon Dubinsky said it was “amazing” to play in front of a packed Nationwide Arena. Johnson also enjoyed training and playing in Columbus. The local fans were pretty darn excited to see this collection of stars take the ice. A crowd of several hundred jersey-clad fans waiting for the doors to open at 5:30 p.m. (the game started a little after 7). There were quite a few Crosby and Kane NHL jerseys, but they were easily outnumbered by a sea of Blue Jackets and Team USA jerseys. One woman was wearing an Eruzione USA jersey from the 1980 Olympic team. “Hey, that’s Nick Foligno,” someone said and several heads turned in the direction of the Blue Jackets captain, who was on his way into the game. Foligno (who was not playing) seemed as excited as the fans to watch the game, and was happy to sign some autographs and pose for a few photos. Team USA’s first World Cup of Hockey game is Saturday against Team Europe. They take on Team Canada on September 20 in a game that could very well decide first place in the four-team Group A that also includes the Czech Republic. Group B includes Finland, Team North America (23-and-under players from the USA and Canada), Russia and Sweden. The three-game finals begin Sept. 27. The Blue Jackets begin their season October 13 when they host Boston.